A tour bus operator was driving drunk when he fatally hit a pedestrian on Manhattan's West Side Saturday night, police said. Police charged the driver, a Florida man, with DWI and vehicular manslaughter. Just before 10 p.m. Saturday, police discovered a 29-year-old man unconscious and severely injured underneath a Travel Lynx tour bus in Manhattan. 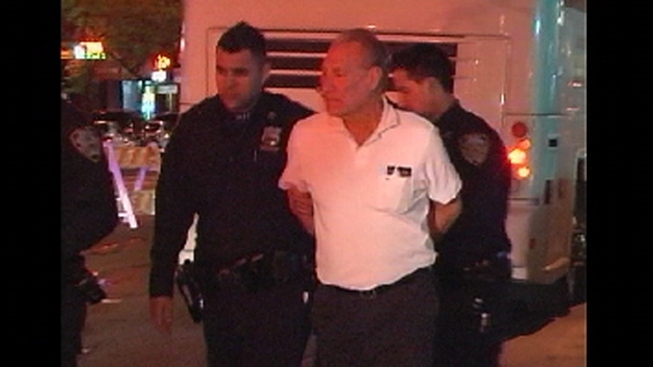 The man was taken to Bellevue Hospital, where he died. He was later identified as Timothy White of Oak Lane Avenue in Philadelphia. Investigators believe the bus hit the victim as he tried to cross Ninth Avenue at 47th Street while the bus was turning from the street onto the avenue. Police say the bus was carrying passengers, but none was injured. It was not immediately clear where the bus was coming from or headed. The driver, Steve Drappel, 57, of West Palm Beach, Fla., was arrested and charged. Police didn't have attorney information available for him.